Cadillac Rental in Chicago now available through Chicago Exotic Car Rentals. 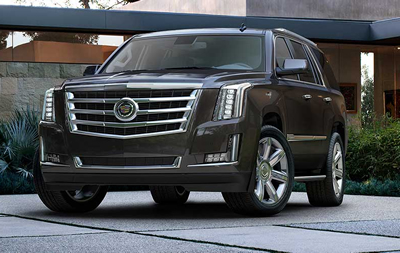 Enjoy the luxury of the Cadillac Escalade. Our new Black Cadillac Escalade is fully loaded with EVERY option available. Enjoy features from navigation, heated seats, rear-view camera, LCD TV, XM satellite radio and more. Our Cadillac Escalade can seat up-to 7 passengers with third row leather seating. The chrome detailing is perfectly designed from the grille to the gratuitous fender vents to the body-side molding. The power of the 403hp V8 engine gives the Cadillac the power it deserves. Rent the new Cadillac Escalade from Chicago Exotic car rentals today. All prices subject to change. Blackout dates may apply. Please see our rental polices for more information.